Inbuilt direct variation link feature. see this. Change product image on swatch hover on category/archive pages. see this. Color , image swatches compatible with [product_page ] shortcode. see this. 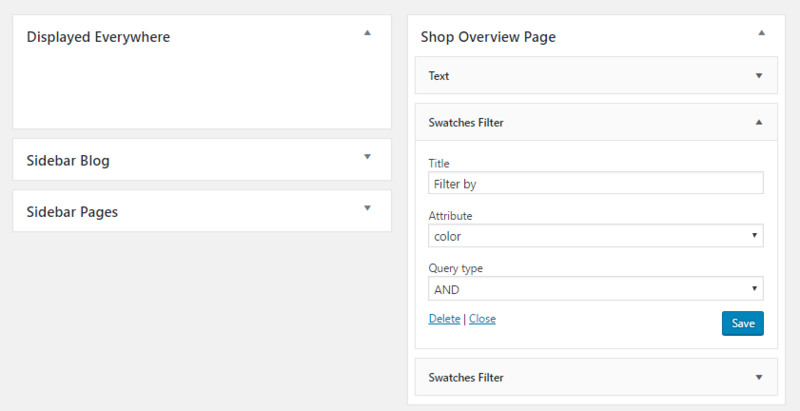 You can opt to display swatches of any one product attribute below product title on shop/category/tag archive pages.Product images will be replaced with swatch hover image whenever user takes cursor on any swatch. Plugin comes with easy to use admin UI which will allow you to set color , image or other options in no time. 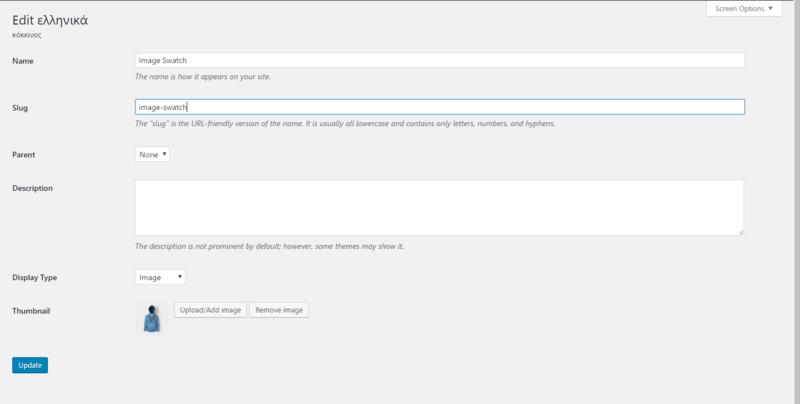 You can also set image or color settings for each attribute value on attribute edit page . Once you set the image , this values will be used automatically for front-end swatch wherever preset attributes are used for variables. Version 2.7.07(21 april 2019) Fix – Bug with colorpicker for hex typing. 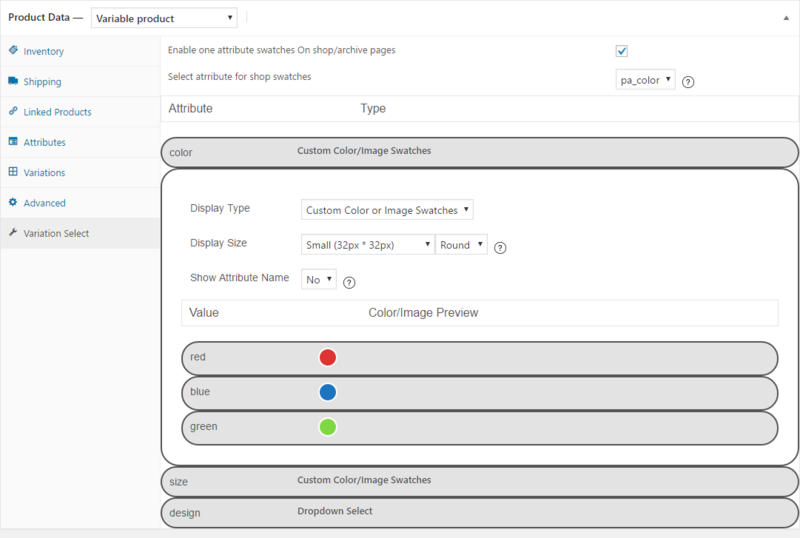 Version 2.7.06(21 april 2019) Fix – Bug with global shop swatch attributes , Add – Added hooks to globally manage shop swatches. Version 2.7.01(15/01/2019) Fix – Close iris color picker when focus is lost. Fix – Bug with using variation images as swatch images. Fix – Color picker issue with latest wordpress. Fix – Media Upload issue with latest wordpress. version: 2.6.03 (26/10/2018) – fix – restore available options on clear selection. version 2.6.02 (26/10/2018) – removed woocommerce_after_add_to_cart_button hook from variable.php . version 2.6.01 (25/10/2018) – Added option to hide unavailable options. version 2.5.9(18/10/2018) – Fixed disable variation issue on clear selection. version 2.5.8(18/10/2018) – Fixed issue with previous update. version 2.5.7(18/10/2018) – Disable unavailable options on page load. version 2.5.6(11/10/2018) – Removed console log entries on single product page. version 2.5.5(11/10/2018) – Fixed bug related to hiding unavailable options. version 2.5.4(03/10/2018) – Fixed js error. version 2.5.2(07/09/2018) – Fixed malware warning. version 2.5.1(13/06/2018) – Removed //do_action( ‘woocommerce_before_add_to_cart_button’ ); from variable.php . version 2.4.12(05/06/2018) – Fix-extra space between swatches and clear selection link. version 2.4.11(13/04/2018) – Fix-use of slug when default option is chosen. version 2.4.10(10/04/2018) – Fix-use of label as selected option instead of slug. version 2.4.9(13/03/2018) – Added version check tags for woocommerce 3.2+. version 2.4.8(13/03/2018) – Added option to use variation image as swatch image in case of single attribute. version 2.4.7(12/03/2018) – fix- Removed default dark color for attribute label. version 2.4.6(12/03/2018) – fix- clear selected attribute upon swatch deselect. version 2.4.5(16/02/2018) – Fix – clear selection link appears before swatches. version 2.4.4(14/02/2018) – Show selected attribute name on single product page. version 2.4.3(28/12/2017) – fix for avada pricing issue with update 2.4.1.
version 2.4.2(27/12/2017) – added support for category shortcodes. version 2.4.1(07/12/2017) – fixed pricing issue with avada theme. version 2.4.0(25/06/2017) – Fix – Removed display:none; property on single_variation_wrap into variable.php template. version 2.3.9(02/06/2017) – fixed debug error on wooswatches tab. version 2.3.8(20/05/2017) – Fixed debug error on wooswatches tab in the backend when variation link feature is enabled. version 2.3.7(17/05/2017) – Fixed debug error ,Fixed debug error on [product_page ] shortcode , Fixed direct variation link incompatibility issue with WC 3.0 .
version 2.3.6(22/04/2017) – Removed plugin update library. Use http://envato.github.io/wp-envato-market/ instead,Fixed Js output bug on simple products,Fixed debug errors on single product page. version 2.3.5(16/04/2017) – Bug fixed with previous release. version 2.3.2(14/04/2017) – Fixed debug erros, change in frontend js. version 2.3.1(08/04/2017) – Fixed bug related to previous release. version 2.2.9 (18/01/2016)- Fixed debug errors on my account page. version 2.2.8 (18/01/2016)- Added- rel=”nofollow” to filter widget links. version 2.2.7 (24/10/2016)- Added- wcva_after_attribute_swatches hook,Tweak- Change in textblock CSS. version 2.2.6 (17/10/2016)- Fix- Filter widget swatches showing css output. version 2.2.5 (11/10/2016) – Fix- hover image not getting removed under product/attributes. version 2.2.4 (09/10/2016) – Fixed bug with previous update. version 2.2.3 (08/10/2016) – Filter out unavailable options. version 2.2.2 (07/10/2016) – Replaced smallipop with powerTip, Show shop swatches in related products and you may also like section. version 2.2.1 (05/10/2016) – Replaced minitip with smallipop,Fixed bug with previous version. version 2.2.0 (04/10/2016) – Fix – Swatches not showing under private mode. version 2.2.0 (04/10/2016) – Added – Inbuilt swatches product filter. version 2.2.0 (04/10/2016) – Added – Shop swatches now works with global values as display type. version 2.2.0 (04/10/2016) – Added – wcva_show_hidden_dropdown hook to show dropdowns along with swatches. version 2.2.0 (04/10/2016) – Added – Option to change hover image size. Version 2.1.8 (29/09/2016) – Fixed minor css bug. Version 2.1.7 (26/09/2016) – Added hook wcva_disable_unavailable_options hook. Version 2.1.5 (24/09/2016) – Removed disabled=”disabled” attrabute on add to cart button,Fix for debug errors related to shop swatches,CSS tweak for round swatches. Version 2.1.4 (22/09/2016) – Fixed shop hover swatch border issue,Fixed shop swatches wrong order issue. Version 2.1.3 (21/09/2016) – Added border on hover on shop swatches, Fixed bug with direct variation link,Fixed below name CSS issue,Fixed blurry hover image issue. Version 2.1.2 (20/09/2016) – Some CSS tweak,Fix for fatal error due to class conflict. 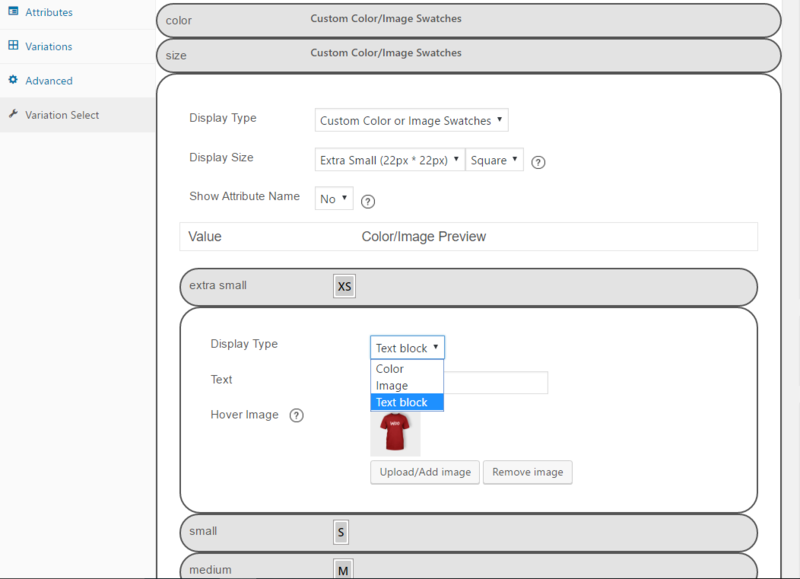 Version 2.1.1 (20/09/2016) – added class to hidden select element,option to replace hover with click on shop swatches. Added option to disable tooltip on iOS devices to avoid double click. Added wcva_attribute_swatch_display_type and wcva_attribute_swatch_image hook. Added inbuilt direct variation link feature. Added textblock option as attribute display type. Version 2.0.3 (24/08/2016)- Fixed debug errors, remove “disable [product_page ] shortcode support checkbox” from plugin settings page. Version 2.0.2 (14/08/2016)- Added wcva_attribute_display_type hook. Version 2.0.1 (12/08/2016)- Added wcva_swatch_image_url and wcva_hover_image_url hooks. Improvement in page loading speed. Fixed bug with global display type. Added feature to manage attribute options globally. 1.8.1 (11/02/2016) – Fixed attribute label translation issue with WPML,removed custom label option. Fixed CSS issue related to “attribute name below swatch”. Fixed compatibility issues with Woocommerce 2.5. Fixed compatiblity issues with WP 4.4. Improvement in frontend single product page css. Fixed shop hover image change issue with virtue,pinnacle theme. 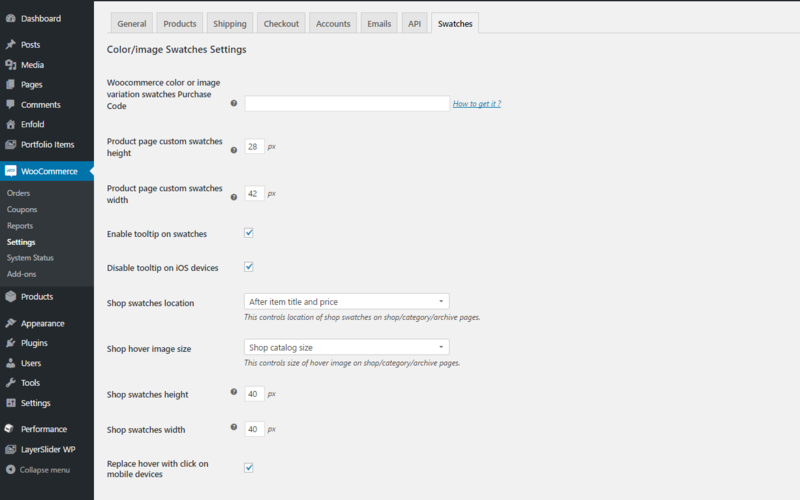 Moved plugin settings to Woocommerce/settings/swatches tab from Woocommerce/settings/products/display. 1.6.8 (25/11/2015) – added optional tooltip on swatch hover,few changes in plugin css. 1.6.7 (06/11/2015) – made button classes unique to avoid conflict on attribute edit page,fixed one debug error. 1.6.6 (23/10/2015) – fixed bug that makes attribute label selected on click,fixed bug related to default options. 1.6.5 (20/10/2015) – Fixed bug related to different term slug and term name,some changes in automatic plugin update related code to improve performance. 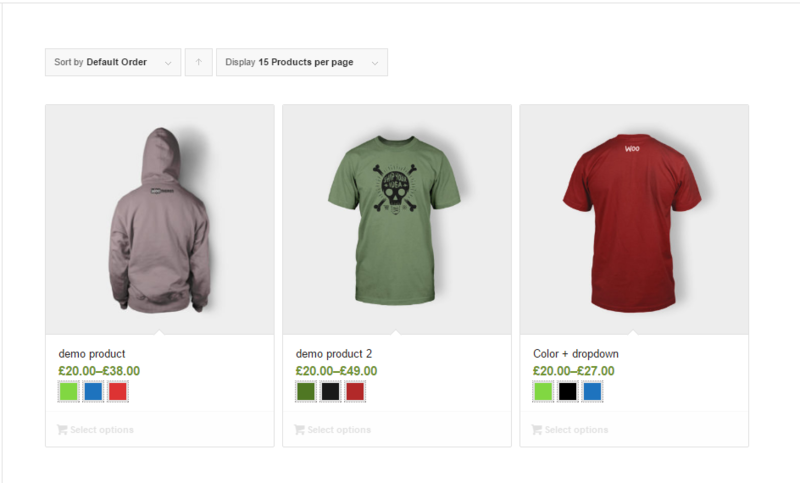 1.6.4 (16/10/2015) – Fixed custom label text bug,added option to use custom product page swatches height/width. 1.6.3 (13/10/2015) – Fixed wp_debug error,fixed bug related to global attributes. 1.6.2 (11/10/2015) – Change in purchase code verification code, added [product_page] shortcode support, fixed conflict issue due to space,rowurldecode,minor changes in product-frontend.js file. 1.6.1 (11/10/2015)- Fixed bug related to previous release. Fixed variation description related issue. Fixed issue related to special characters. Verified functionality with latest wordpress 4.3 and woocommerce 2.4.5. Fixed bug related to global attribute color or images. Added Direct Variation link Support on Shop Swatches. Added Option to change the location of Shop Swatches. Moved Shop swatches settings from general to products tab. Version 1.3.1 – Added rowurlencode to backend and frontend lable text. Displays Swatches below each product on shop/category/tag pages. Changes product image on swatch hover. version 1.2.1 – Fixed Small Issue with Greek Language. Fixed Compatibility Issue with YITH WooCommerce Zoom Magnifier. Fixed Compatibility Issue with Multiple Images Per variation Plugin. Fixed Image Zoom Compatibility Issue with IDSTORE,LEGENDAV,AVADA Theme. version 1.1.5 – Some changes in plugin code , no change in features. version 1.1.4 – Fixed issue with decimal values , Removed Admin attribute header preview. version 1.1.3 – Fixed bug related to global color or image. version 1.1.2 – Support attribute name to be displayed under swatch. version 1.1.1 – added title hover to swaatches. Fixed compatibility issue with IE 11. Improved Front-end Compatibility with Major themes. Little tweak in admin side code. Verified Compatibility with wordpress 4.0 and woocommerce 2.2.8. Verified functionality with All major browsers including IE 9,10,11. Improvement in global Color or image per attribute. 1.0.8.1 – fixed bug related to woocommerce older versions. replaced green border with black border on checked for image or color. fixed issue with default option selected on product load. Loads default select for IE11. Fixed Compatibility issue with IE. Replaced Common display type selection with Per attribute selection. added color or image settings on attribute edit pages. added radio button support . Removed custom label text option . fixed bug related to variable add to cart button.